Now is the time to be gearing up to celebrate a new season in the church’s year; “Creationtide”, which is dedicated to God as the Creator and Sustainer of all life. Creationtide originated in 1989 when the Ecumenical Patriarch suggested that 1stSeptember, the first day of the Eastern Orthodox Church’s year, should be observed as a day "of protection of the natural environment". The annual Christian season of Creationtide (or Creation Time) begins on 1st September and goes on to encompass many harvest festivals. It culminates on 4th October at St Francis’ Day. It is a time for Christians to contemplate the link between their spirituality and the need to care for God's creation. 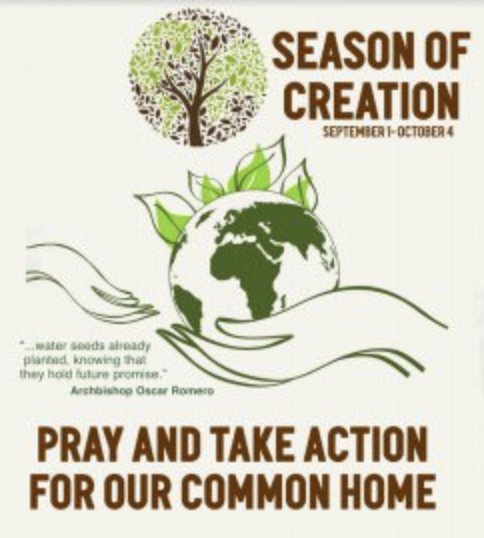 Creationtide has now spread widely among Anglican, Roman Catholic and Protestant congregations, bringing Christians together to pray and work for the protection of the natural world that sustains everyone. For several years six of the CofE dioceses’ in the South West from Gloucester down to Truro have been collaborating on environmental projects. The annual Carbon Fast was a high profile event which provided an environmental “thought for the day” to hundreds of people who signed up to receive daily emails during the 40 days of Lent. However, our meeting in March 2017 at Exeter decided that Lent has associations with dumping “green guilt” on people whereas Creationtide in late summer has a much more positive vibe! Therefore, in September 2017 and again this year our efforts have switched to providing resources for Creationtide in the South West of England. In common with the other five Diocesan Environmental Advisers, one of my most important tasks has been to persuade busy clergy to write short articles that will soon be available for those who sign up for daily prayers and reflections. In the past two years several parish churches in the Cotswold Hills have been busy creating a wild flower meadows, bug houses and composting toilets ("eco loo"). In July 2017 the Diocese of Gloucester was produced a 5-minute video of Elkstone's composting toilet including tips on caring for fauna and flora in churchyards. Finally, for anyone who still needs convincing that Creationtide is worthwhile, there’s an excellent video made the Most Revd Justin Welby, the Archbishop of Canterbury. This is the sort of endorsement that will hopefully make Creationtide a permanent feature in the life of the Anglican Communion for 85 million people in over 50 countries around the world. Watch this space!